My friends wrote about their CMT tricks and I am in awe of their challenges and solutions. What amazing women! I looked at my own day with a new perspective. How does CMT impact my day? After all, I work (part time), take photos, answer emails. Just like everyone else. Not that much impact, right? Ha! Big impacts. Everywhere. This photo is my metaphor. 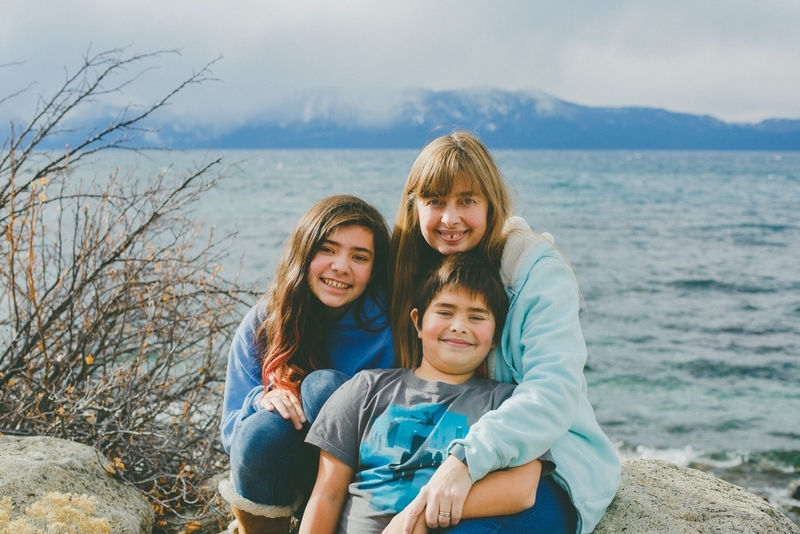 What are the blurry silver lines between me and my kids? My crutches. Because my accommodations demand attention these days. CMT may not be obvious, but it affects everything. CMT creates a new normal. A normal that changes over time since CMT is degenerative. And also changes day-to-day with fatigue or injury or overuse. CMT greets me first thing in the morning. I have to stretch my calves so my heels touch the ground. These days, with my ankle injury, I gently flex to see if it hurts more or less than the day before. As I sit on the edge of the bed, before I take a single step, I check in with myself. Numb fingers? Left or right hand worse than the other? Which braces should I wear? I have a lot of braces. Braces for my wrists, and AFOs for my feet. I also have a giant 'boot' brace for my sprained ankle but that wouldn't fit in the photo. I usually wear one or the other for my hands- depending which hand feels worse. My numbness flares up depending if I crafted or typed the day before. These days, my crutches aggravate my hands like crazy (I knew my hands wouldn't like crutches). The AFOs help stabilize my weak muscles. They are also supposed to help with fatigue. Oh, I forgot about my custom orthotics that fit into shoes to support my high arches. I also think of the day. Am I walking a lot? Going to sew or type or edit photos? Clicking the mouse button has given me carpel tunnel issues. How can I best accommodate those activities? Oh, and chores. Where will chores fit into the day? These are the first reflections and decisions of the day. How can I make life easier? How do I balance mothering, teaching, creating, and this always-tired body? Because my big challenge is constant fatigue, which doesn't get fixed with a nap or a good night's rest. One of my necessary tricks is that I only wear dangling earrings. I can't manage the post earrings anymore. My pinch grip is too weak and they are so tiny! Easier to skip them altogether. I am getting to that place with necklaces, too. Except those are harder to solve. The lobster claw clasps can drive me insane on a tough day. Again, so tiny and requires a lot of dexterity and finger-strength. I usually skip necklaces these days. I had a couple of necklaces with magnet clasps, but they fell off. Uh oh. I could go research solutions, I suppose, but that requires energy. Which is the most valued resource around here. These days, we moved a lawnchair into the shower for my injured ankle. But I may keep it, because it is a lot more stable. When I close my eyes, I get very wobbly. One doctor said my perceptions are compromised because my nerves do not send accurate information. My brain has difficulty placing my body in space. I am very dependent on visual cues for balance. I just realized this could be a very long post. And that energy? Fading fast. So perhaps this is part one. I have tools to help open jars. And a Disabled Parking Permit. That is a huge help. I got it first for big events or places like amusement parks. But I find it makes a big overall difference in my most valued resource- energy. My challenge is that I never know when the energy-supplies will run dry. I never know when that extra activity will make a tendon angry or a joint slip or...anything could happen. So I deal with the questioning looks, the curious stares as I unbuckle my boy from his carseat. I can almost hear them thinking that I am misusing my mom's, or my grandfather's parking privileges. I try not to let it drag at me. They don't know my story, and I wouldn't wish the fatigue or the crash I can get once I arrive home... I wouldn't wish that on anyone. And I am happy to answer if anyone asks. I have actually heard worse from people who know me in a different context, like in the classroom. Then they see me pull into a 'Blue Spot' and they get confused. I have heard, "But you're not disabled. You walk fine." They can't see pain. Or the crash that finds me once I get home. Again, I let them have their opinions. I know me and I know what I need. Okay, energy fading fast. Three last things. Then, sleeping. Oh, I love my sleep. I need many hours a night, and often appreciate a good nap during the day. I sleep deep. And a good sleep heals me. I love sleep! Finally, I heard a story where an elder sat a child on his knee. Your heart is a forest, he said, and two wolves live in this forest. One wolf is dark. He is loss and despair. The other is light. She is dreams and hope. These wolves battle to own your forest, to own your heart. To own you. The child frowned. Which one will win? That, young one, depends which wolf you feed. And that is my biggest trick. Because there is plenty of loss and darkness on this journey. A heaping plate of frustration. But there are also sunsets and music and chocolate mochas. There is this. This is my best trick of all. Love is love is love, and love is powerful magic. I use creativity. And my family. And my friends. To help me keep the light and hope strong. At night, I reflect on the gifts of the day. I make plans for tomorrow. Make no mistake, my motto is make life easier. Because then, maybe, I will feel better. But who knows? I don't hold my breath waiting for a cure, or for my challenges to disappear. No, I reflect on my day and the wonders of my journey. The joy of light. Of hope. Here's to hope. May your day bring you plenty of inspiration. Nic's Tricks are posted here and Melissa's are here. Enjoy!